Hundreds of students walk out of school to rally against gun violence, April 20, 2018, in downtown Los Angeles. 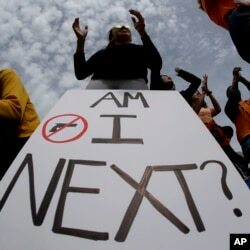 Protests were held across the country Friday, on the 19th anniversary of the Columbine High School shooting. Demanding an end to gun violence and tougher restrictions on firearms sales, thousands of students again walked out of classes across the United States on Friday, aiming to put pressure on politicians ahead of November's midterm elections. Timed to coincide with the 19th anniversary of the Columbine High School massacre, students left classes at midmorning, many waving placards with slogans including "I should be worried about grades, not guns" and "Enough is enough." Organizers said students from more than 2,600 schools and institutions planned to take part. Olivia Pfeil, 16, a sophomore at a high school in Oconomowoc, Wisconsin, held a sign bearing the names of mass shooting victims. "We're expecting change or come next election cycle we will support politicians who are listening to the voices of the youth," she said. It was the second student walkout since the February 14 massacre of 17 people at Marjory Stoneman Douglas High School in Parkland, Florida, and the emergence of a national student movement to end gun violence and toughen restrictions on firearms sales. Hundreds of students gather, April 20, 2018, at the Capitol in St. Paul, Minn., to protest gun violence, part of a national high school walkout on the 19th anniversary of the Columbine shootings. "[The Columbine killings] happened, like, 20 years ago, and we are still getting mass shootings in schools," said Ayanna Rhodes, 14, who walked out of Washington International School. Two gunmen went on a shooting rampage at Columbine High School in Colorado in 1999, leaving 12 students and a teacher dead before killing themselves. The massacre stunned the nation, but since then, school shootings have become commonplace. Even as students prepared for their protest on Friday morning, news began trickling out that a 17-year-old student had been wounded in a shooting at a high school near Ocala, Florida. A suspect was arrested soon afterward, police said. That gun violence unfolded about 225 miles (360 kilometers) northwest of the Parkland high school, where two months ago a former student killed 17 people in the deadliest high school shooting in U.S. history. Despite widespread revulsion over the school shootings, the issue of gun control remains sensitive in Colorado and across the country, where the Second Amendment to the U.S. Constitution guarantees the right to bear arms. High school sophomore Dakotah Brown, 16, holds a sign at a rally for tighter gun laws, April 20, 2018 in Kansas City, Mo. Dudley Brown, president of the Colorado-based National Association for Gun Rights, said the gun control movement seeks to have the government take away constitutional rights. In some school districts, administrators told students they could face disciplinary steps if they walked out. "They told us we would get in trouble if we walked out, and we told them it was a peaceful protest, we're not causing any damage," Fierro said. "This is over a serious topic that people are pushing aside." The principal declined to answer questions from Reuters. It was not immediately clear whether Friday's turnout matched those of earlier protests. 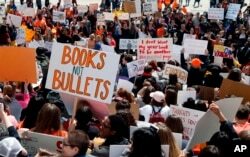 More than a month ago, tens of thousands of students from 3,000 schools participated in the #ENOUGH National School Walkout to demand tighter gun regulations. 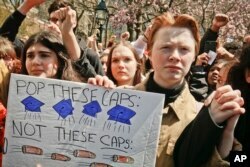 High school students protest during a rally calling for stronger laws on firearms, April 20, 2018, in Washington Square Park, New York. On March 24 there were "March For Our Lives" rallies in cities across the United States that were some of the biggest U.S. youth demonstrations for decades, with hundreds of thousands of young Americans and their supporters taking to the streets. On the evening before the walkouts, Colorado gun control activists rallied near Columbine High School. Carlos Rodriguez, 17, a junior at Marjory Stoneman, traveled to Columbine for the anniversary and said he found a sense of solidarity in the outpouring of support. "That's the only thing that's keeping us Douglas students alive right now: the distraction of fighting for our rights and advocating for our lives," Rodriguez told Reuters. There was no walkout at Columbine, which has not held classes on April 20 since the massacre. Students were encouraged to take part in community service instead.